March Week Three » What's Under the Needle? 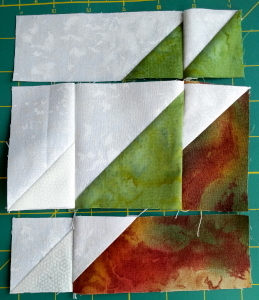 "I started my piece by making two Arrowhead Variation blocks which meant making half square triangles. I pieced them together, row by row. Once the first block was done, I worked on the second then joined the two together. 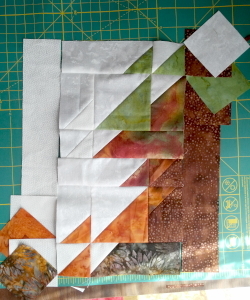 My original plan was to just have the two blocks, but once I had them pieced together I realized that my piece was not very wide. To remedy this, I decided to add a panel on each side. 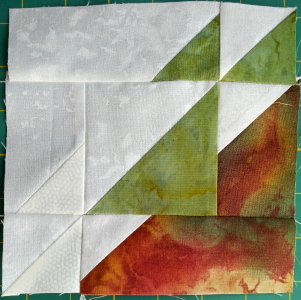 I played around with some half square triangles in the opposite direction as the block on the ends. In doing this I realized it helped to emphasize a couple of my elements - bringing more negative space to the upper left side of the piece, and making the tree more pronounced on the right side of the piece. It's great when happy accidents work out for the better! 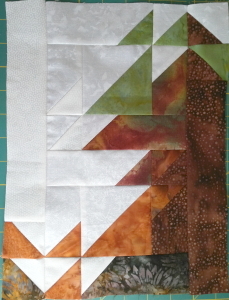 With my piecing done, the last thing to do was organize the applique. I wanted three balloons and hand-drew my templates, making each balloon a different shape. Next were my leaves. 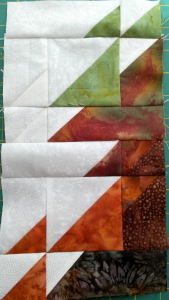 I decided four was a good number for this piece, two big and two small. I decided to hand-draw these too as the leaves I used in the last challenge were quite fiddly so didn't want to use those. My only issue was these leaves ended up just as fiddly - I am sure I will appreciate that next week when it comes time to do the stitching! 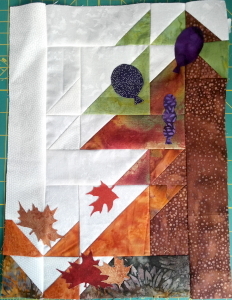 With my applique pieces drawn and cut out, the last step was to arrange them and press them in place. The balloons were easy to place, having them floating their way up the tree. I played around with the leaves a little longer, finally settling on having three of the four leaves already off the tree and on the ground, with the fourth leaf just holding on to the tip of a branch."